It’s no secret that a bad roof can be one of the most dreaded home repair problems that anyone faces. After all, it can be very expensive, a massive endeavor, and extremely frustrating. Additionally, if the roof leaks, then it could cause more expensive damage throughout the home. Traditionally, aluminum roofing is used on a mobile home, and occasionally, asphalt shingle have been chosen, but neither of these offers the ideal option for a variety of reasons, including lack of energy efficiency, weight concerns on mobile homes, and easily damaged surfaces. 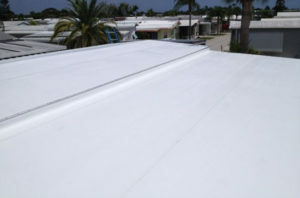 This is why mobile home rubber roofing is becoming very popular. What Is a Mobile Home Rubber Roof? Rubber roofing comes in many different varieties. Traditional rubber roofs are made out of a material called EPDM (ethylene propylene diene monomer), a type of synthetic rubber. EPDM is very soft black or white rubber with almost no tensile strength, mostly used in northern climates because of its cost effectiveness. This product is not a good fit in Florida and more importantly not a good fit for use in mobile home roofing applications or high traffic areas, because of its color and lack of tensile strength. PVC membranes are another type of roofing material which have more plasticizers in them, these plasticizers migrate to the top causing air-Bourne contaminates to stick to the surface, causing it to attract mold and mildew. This gives the roof a poor appearance and shortens the life expectancy. Although we offer both PVC and TPO, we have had greater success and longevity from TPO. Since PVC can be less expensive, this is why some people choose to go with it. TPO, is made from a pliable material called thermoplastic polyferin. It is made in rolls that can range from six to 12 feet in width. This way, there will be fewer seams to seal, so the roofing will be even more leak-proof. This type of roofing can be used as a roof over, meaning it goes over the existing roof and is the perfect option when replacing an existing roof on a mobile home. It can be installed professionally and is very easy to repair. AllWeather Roofing, Inc. has applied all types of rubber roofing systems but our preferred membrane is TPO, because of the high quality. One of the biggest advantages to the white roofing, especially in Florida is the energy cost savings. For this reason, we prefer to install TPO; we feel it’s the highest quality membrane. Our roofs not only come in white, but we also have a shingle pattern that comes in grey and tan colors. There are plenty of reasons why you should consider a rubber roof, particularly a TPO membrane roof, when your mobile home needs a roof replacement. It is inexpensive compared to other roofing options. It is incredibly energy efficient. The white material combined with the proper thickness ensures that as much as 78% of the sunlight will be reflected back. It is easy to install and repair. That means you will spend even less money on the roofing altogether. It is designed to be leak proof. Since there are very few seams and they are heat sealed, you don’t have to worry about pesky leak problems in the future. It is durable and will not be affected by heat, cold, rain, wind, and other weather problems. It stays pliable in heat or cold so that you don’t have to worry about cracking. There are definitely advantages to mobile home rubber roofing, and it certainly can be a good option for a mobile home as well as other properties. How Is a Rubber Roof Installed? Remove the old roof and shore up any weak areas. Frame out the top of the house. Place the rubber roofing and heat seal it. Finish off the edges and vents. It’s a simple process that a professional installer would be able to manage. What Are the Costs of a Rubber Roof? A rubber roof will be much less expensive than other roofing options. However, the exact price will depend on a number of factors, including the size of your home and any unique features of your roof that need to be managed. Looking for more answers about rubber roofing? Contact us by filling out our online inquiry form so that we can start discussing your rubber roofing options. If you would prefer to call, then we can be reached at 800-297-3758, and we are available 24 hours a day to help you make the right choices.